My Mom was sure Gloria was going to be born before her guess date (March 15th), so when I started to have pressure waves on March 12th during my friends’ movie premiere I thought that she would be making her grand entrance that night or maybe the next day. Our friends Sarah Breck and Dax Orion Hock have a close bond with us because our first-borns were due on the same day last year and I took care of their son Huxley for several months. It seemed to make sense even though that was 11 days before her due date. My pressure waves kept coming closer together until they were 5 minutes apart lasting a minute each. I rushed home and I told my husband Nicholas to pack-up the car because she was on her way. Well, Gloria decided to stay where she’s at and play with us for over two weeks. Staying inside my beautiful pink Bubble of Peace really helped me wait for her arrival. Every night pressure waves would begin early in the evening until they developed a steady pattern by around 7 or 8… sometimes 9. Using my Finger-Drop technique and turning my light-switch to off enabled me to stay comfortable and in hypnosis during this time. I started to be discouraged thinking she didn’t want to meet us until our friend Janine Brummer reminded us that she was probably hanging out with her older sister Adelita in the in-between space and that warmed my heart. With my spirit renewed, I decided to await Gloria’s arrival patiently. Then on the morning of March 28th, pressure waves came on strong at 5 in the morning. Quickly they started coming closer together and increased in intensity. We called our midwife and she asked us to call our doula Michelle Frias-Rodriguez, so that she can observe the pressure wave pattern and make the call if it was time to head to the Birth Center. We did so and soon after she, as well as my sister Gaby, arrived at our home in Maywood we decided to drive over to the vicinity of the Community Birth Center since it would be a drive to get over there and we didn’t want to risk getting stuck on the road if Gloria decided to make a quick entry. We got to a park close to the Birth Center in Beverly Hills at 7am. I stayed there a little while longer until it became apparent that pressure waves were continuing to get closer together and more intense. Mind you, I did not feel pain because we took Hypnobabies classes with Kimberly Gross and I felt prepared. I only felt pressure. 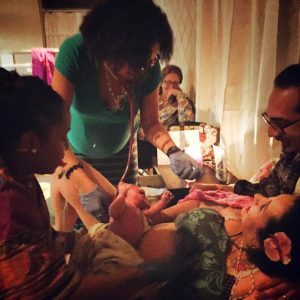 My doula (who is also a close college friend of ours) then called our midwife Racha Tahani Lawler and she had just arrived at the Community Birth Center and was setting up for us, so we headed over excited to meet our second daughter soon. When we arrived at the Birth Center, there was such a beautiful serene energy and I felt sure that we decided on the best place to birth our daughter. I especially felt good that the student midwife Tanya Smith-Johnson who was also pregnant was able to be there. We had a sheet to remind us of different birthing positions and my husband helped me go through every single one I wanted to try. It felt like trying different positions were helping to speed up Gloria’s arrival and I felt good about that. Using my Peace cue to breathe my hypno-anesthesia down through my body kept me comfortable and relaxed. The whole time I felt completely supported by my birth team led by my husband. When it came time to push I was ready to give it my all. I am not going to lie, I did feel some discomfort during the pushing phase but it was quick. We arrived at the Birth Center at 8am and Gloria was born at 10:28am with her fist up. The entire birth team was in tears of joy at the sight of precious Gloria.